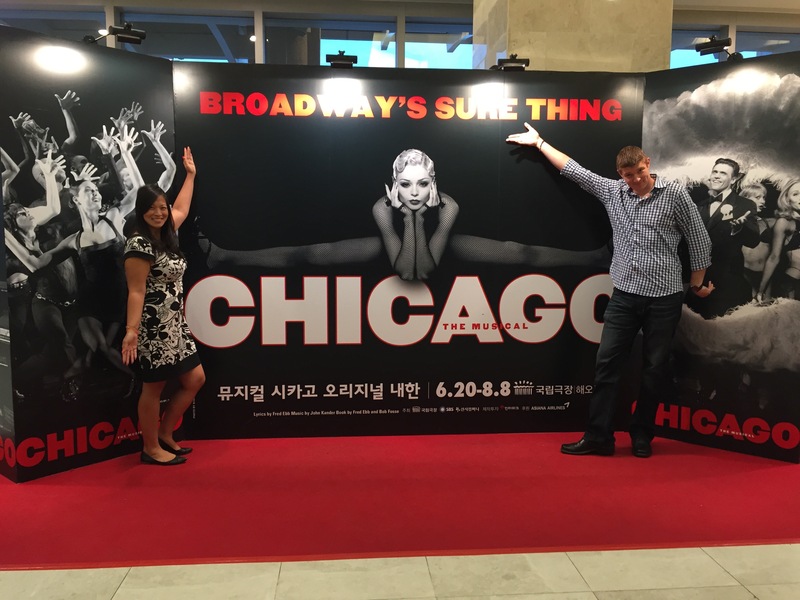 We have been seeing signs all over Seoul for the musical Chicago, and since we haven’t seen that show yet, we decided it was time to pay a visit to the National Theater of Korea (NTOK). Here’s our experience with the NTOK! We took a taxi to the Theater, however, there are lots available for you to park as well. The parking fee is only 3,000 won (4,000 if you don’t pay before the show is over). We avoided taking the subway as you have to take a shuttle/bus to the theater from the subway stops and we weren’t sure how long that would take. Here are the instructions if you want to travel by subway. Get off at Dongkuk University Station on Subway Line 3. Take the shuttle in front of Taegeukdang, Exit No. 2. or take Bus No. 02 or 05 circulating the Namsan at Exit No. 6. Get off at Chungmuro Station on either Subway Line 3 or 4. Take Bus No. 02 or 05 via Namsan in front of Daehan Theater at Exit No. 2. Get off at Dongdaemun History & Culture Park Station on Subway Lines 2, 4 or 5. Take Bus No. 420 (Blue bus) at Exit No. 8. Get off at Hangangjin Station on Subway Line 6. Take Bus No. 3 via Namsan at Exit No. 2. We were able to easily purchase tickets on the http://www.ntok.go.kr website (their website is in english), you can also purchase tickets on http://www.interpark.com. The seating is divided up into 6 sections. 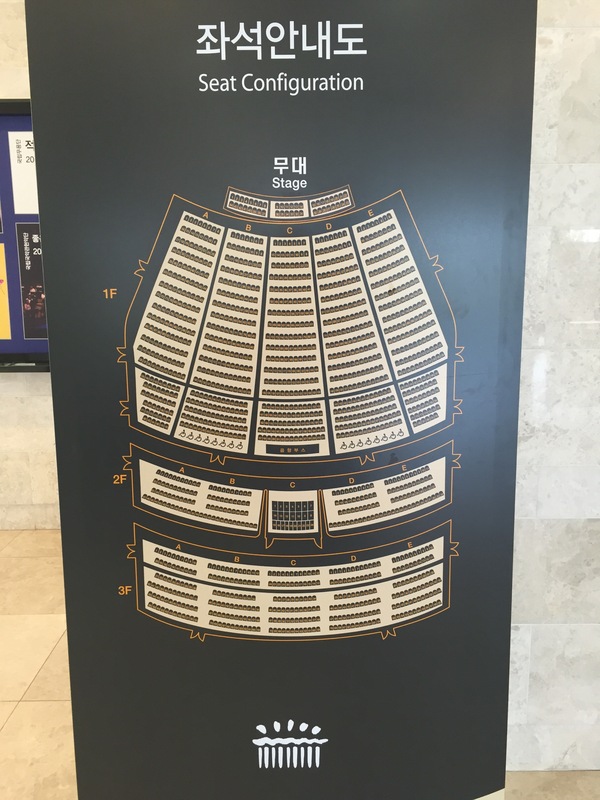 VIP (is the section closest to the front in the middle), R & S (are the 2 sections on either side of VIP), A (is the seats on the 2nd level), B (are the seats on the 3rd level), and OP (are the seats in the Orchestra Pit). So the seats are different than most theaters I have been to, they have a very high back, so it makes it a little difficult to see if you are too close. So next time we go, unless we can get the first row, I will be buying seats more towards the middle of the section (where the incline is more pronounced), so that I will have a better view (without the obstruction of the seats in front of me). 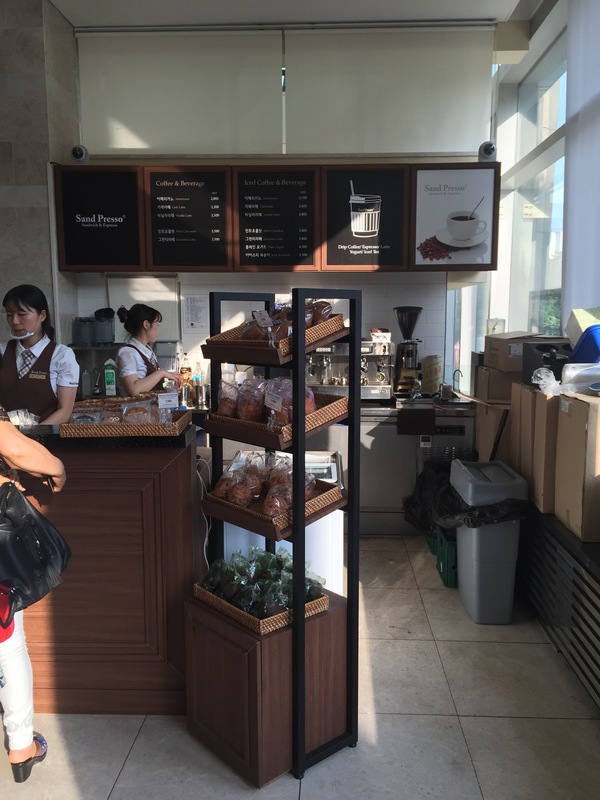 On the ground level there is a small cafe that service coffee, tea, and some other snacks. Prices are extremely reasonable, we were able to purchase a bottle of water for 1,000 won. And then downstairs they have a huge cafeteria that serves a large variety of food and drink. Everything about the show was the same as my experiences in the U.S. The one difference was they have two large screens on either side of the stage for Korean subtitles! The theater was fun and we will definitely be back to see additional shows. 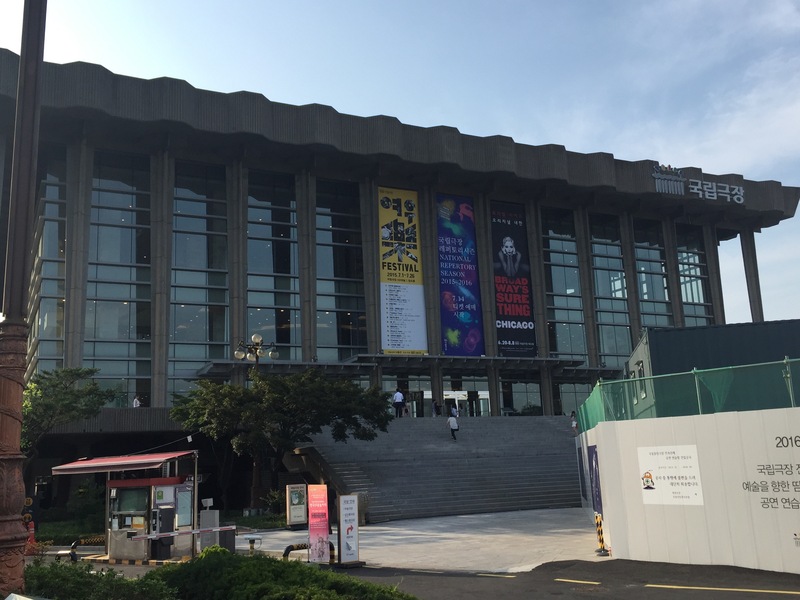 One word of advice is to make sure the shows are in english as one of my friends saw Phantom of the Opera and it was in Korean! Next Post Who’s the burger king? !